Sodium Lauryl (Laureth) Sulfate (SLS) is currently the primary foaming agent of Western civilization. It is usually found in combination with cocamidopropyl betaine (cocabetaine) and diethanolalamine (DEA), which itself has fallen under scrutiny of late. SLS is found in shampoos, bath gels, car washes, dish detergents, bar “soaps”, laundry detergents, etc. It is a wetting and dispersing agent, emulsifier, degreaser and foamer. It also increases skin permeability roughly 100 times and is used in lotions to increase absorption of micronutrients through the skin. It is used in toothpaste to make it foam and also so the paste will stay together when coming out of the machines. Unfortunately it also aggravates the gums causing irritation. A University of Oslo (Norway) report states that individuals with gum disease had their symptoms cleared 40 times faster when non-SLS toothpaste was used. There is a possible link between SLS and permanent damage to the eyes of infants. The Italian study I heard about was 40 years old. This definitely deserves further investigation. May increase hair loss, and promote skin and scalp irritation in sensitive individuals. May produce skin and hair damage including cracking and inflammation. SLS is a known skin irritant and is used in lotion tests. First the skin is irritated with SLS – then the soothing effects of the lotion is tested on it. A (remote) possible bladder cancer risk factor exists. But only if you hold your urine in your bladder for long periods of time (Trucker Syndrome). Soap has been around for thousands of years. Chemical surfactants (foaming agents) for less than a hundred years. You can decide for yourself what qualifies as “natural”. With 16 billion dollars a year at stake you can bet there will be a lot of denial over this one! Try natural handmade soaps – they are really GOOD for your skin. I have washed my hair with them for over 6 years (fine thin dark hair – formerly with split ends and flaking). Try using castile liquid soap based cleaners and hand soaps. Many people find them milder than detergent based hand soaps. I also recommend using castile based fruit and veggie wash on your foods to reduce intake of topical pesticide residues, waxes and microorganisms. 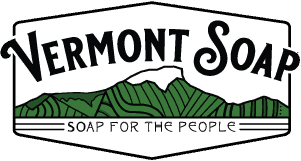 At Vermont Soap we do not use SLS or any other detergent based foaming agents in any of our products. As stated in our Mission Statement, we are in business to provide Nontoxic Alternatives for Life. This originally appeared as a Letter to the Editor of E, the Environmental Magazine — July/August 2000, Volume XI, Number 4, regarding sulfates.